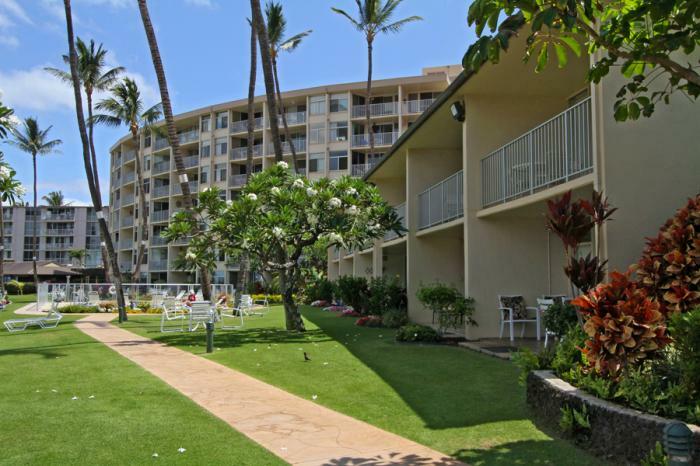 Overlooking a mile long beach of Kamaole II, Hale Pau Hana is located in South Kihei, Maui. A Maui vacation rental offering shimmering ocean blue views and relaxing sunsets. Chase the sun along the rolling coastline, build a sand castle or splash into the warm tropical Pacific blue. Excellent for beach side whale watching during peak season (Dec - April), snorkeling, swimming, sunning, walking or take a yoga class on property. Hale Pau Hana offers tastefully decorated and spacious vacation rentals with private patios (lanais) to kick back on; enjoy the view and sip your favorite drink. This conveniently located vacation rental is close to restaurants, coffee shops, gift shops, and grocery stores. Make your memories last a lifetime, and stay where the possibilities are endless.